Nature isn’t something you go to visit; rather, it needs to be designed into our communities. And while there are many parks designed for children, older adults benefit from features that allow them to sit and feel comfortable, fragrances that stimulate the senses, and equipment that provides an opportunity to stretch muscles easily and fosters social interaction. AARP and Alta Planning + Design collaborated to create an environment that appeals to the senses and gives people of all ages an opportunity to enjoy outdoor spaces. As populations and budgets shrink, cities often face challenges such as how to fund urban canopy care and create neighborhood assets on vacant properties. 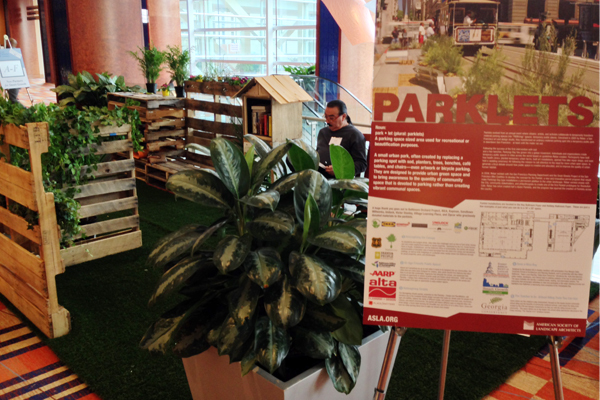 Sponsored by the U.S. Forest Service, Parks & People, TreeBaltimore, and the Baltimore Office of Sustainability, this parklet included demonstrations of innovative uses of wood harvested from the urban tree canopy and demolished buildings, as well as invited imaginings on a potential urban canopy woven into Baltimore through its vacant properties, parks, and streetscapes. Designed by Morgan State University Student ASLA chapter members in partnership with Blue Water Baltimore, this space introduced the tools that planners, policy makes, developers, and citizens have to address pollution of the bay at various levels. 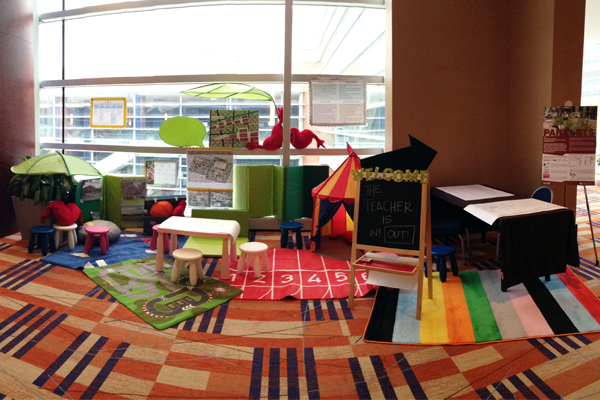 The space included rain barrels, a wetland model, seating, and informational posters. The interactive feel encouraged attendees to view and participate in the water cleaning process simulated in the space and highlighted how Baltimore is becoming more conscious of the Chesapeake Bay. The Teacher is IN: School Siting Tools You Can Use! This parklet space was designed as a school “open house,” focused on the issues around community school siting and the benefits of community-centered schools. 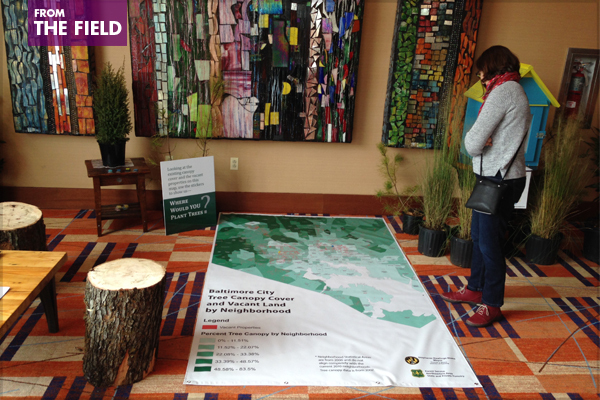 Attendees learned about the siting tools created by U.S. EPA and Georgia Conservancy that can help with the siting process in communities. This open house allowed attendees to dig deeper into school siting approaches as discussed in a NPSG 2015 conference panel. This parklet, presented by Alta Planning + Design and PlaceMatters, introduced attendees to complete street design concepts that make our streets safer for people of all ages and abilities, balance the needs of different transportation modes, and support local land uses, economies, cultures, and natural environments. The parklet featured different ways to integrate bikes into street design and a touch-table demoing the Streetmix tool. The parklet provided a space to have fun while learning about how to make streets more livable. 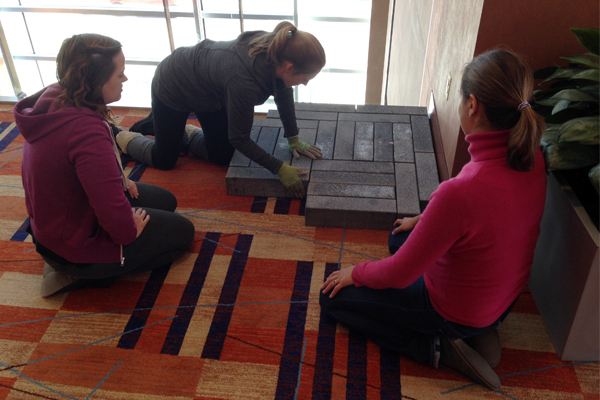 The planning for Parklets 4.0 is gearing up for the 2016 New Partners for Smart Growth conference, to be held February 11-13, 2016 in Portland, OR. If you would like to join the Parklets planning committee or want to sponsor a Parklet, please contact Deborah Steinberg (dsteinberg@asla.org) for more information.